In the previous post of “YOUR VENTURE NOT UPTO SCRATCH?” ; I focused on the importance of design for every start-up/venture and how design plays a crucial role in the venture’s success. I also talked about focussing on 2 essential design elements in this blog post. In today’s post I will focus on the first element ie. Communication Design. Commonly, people focus on graphic design or digital marketing to get engaged with the customers and bring in more visibility for their brands, however they’re missing an essential step here – Communicating Expectations. At BRIM, we take up the target audience’s expectations first and communicate that back to them- as if saying “You too were thinking something like this right? Here we are!” It makes the customers feel connected and be able to relate to the brand easily. So how does communicative design impact the success of venture? Why should they know about your venture? How will they connect to you easily? When will you be accessible to them? Have a small role play with your team to determine how the venture visibility strategy must be executed. Give different roles to each team member and allow them to enact and give feedback to you. With this feedback go a bit further and do a pilot test or make a design teaser for a small group of possible customers. Are you crazy? Young? Techie? Aloof? Grumpy? Whimsical? Strong? Zealous? Whatever you are wanting to project communicate your venture’s personality through the communication design. This gives your customers relate and connect to your brand. The personality traits that your customers will perceive about your venture will make them accept you better. Ensure that the communication design agency or creative design studio who work with you are aware that they need to maintain the tone of the communication consistently. Work with those creative design houses that offer a combination of creative design studios and service design agency. Service design communicates the same aspects of the branding practices that were mentioned in the designs. This makes the venture’s communication become complete. The advertising collaterals give the customers some perspectives of your brand and therefore when they visit your office/site they get the same perspective here too thereby enabling them to see consistency in your brand identity. This may also lead your customers to become your brand loyalists. The young start-ups/entrepreneurs start off with the digital medium of connecting with the customers. Though the digital population is huge; the importance of offline connect cannot be ignored. Inspite of the surge in augmented reality experiences, customers still want to feel and experience the products/services in real sense. Most start-ups/ventures who are able to seamlessly connect the offline and online presence are rewarded with strong customer base. So, make communicative connections in both the formats. 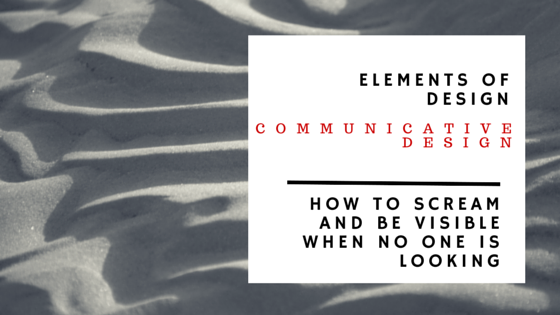 I hope these 5 points help you in getting started with the Communication Design for your venture. So, rope in a design agency which gives you all these benefits together for your brand positioning and strategy and you’re sure to win not only attention but also laurels. Absolute read for #startups #entrepreneurs!!! Previous Previous post: YOUR VENTURE NOT UPTO SCRATCH? Next Next post: IS YOUR VENTURE DIGI-TALL?